More proof liberals make choices based solely on feelings and emotions, they have no common sense or logic, none, zero, zilch, nada! This is infuriating! I made my choice for Trump by watching full speeches, press conferences, and debates for both candidates and I didn’t buy into the MSM’s hype or their skewed polls. I’m also a college graduate and voted for President Trump. They are so out of touch with reality its disturbing. Ph.D. and voted for @realDonaldTrump. That’s what is so wonderful about the voting booth. No one sees who you vote for. You can make your voice heard. It’s pretty powerful, which is why some want to change it. Another reason to give thanks that woman is not president. People like those in this exchange would have continued to enjoy free range across the government. Not just at DoJ. 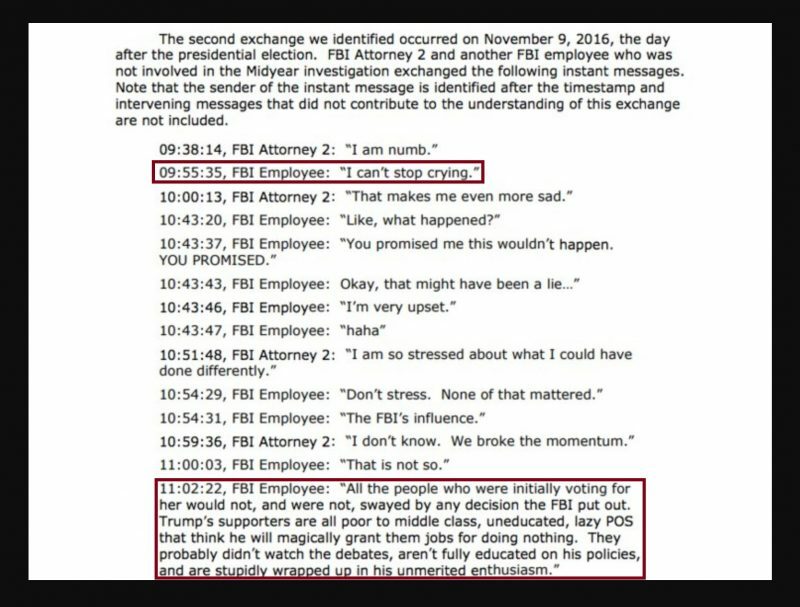 I would love to tell that snotty, ill-informed “FBI employee” that my husband and I both work hard, hold postgraduate degrees, have a good household income and support our POTUS. We watched the debates and are fully informed about the issues. Idiots. I feel bad for Americans that their supposedly top level law enforcement organization has this kind of political bigotry. How would any victims of crimes get fair treatment when this attitude exists?  is no better though. Since they’re painting with one stroke one could say that Hillary had the inner cities, the illegal immigrants, and the criminals. Many of those are poor and uneducated and don’t watch the debates and aren’t educated on policies. Just wrapped in what the country can do for them.